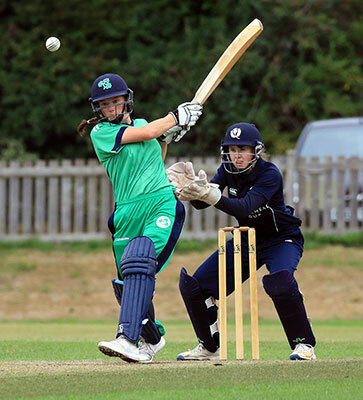 Ireland Women's A team eased to two comfortable wins against Scotland's Under 21 side in a T20 double header at Uddingston. Lara Maritz was the Player of the Match in the first encounter, as she top scored with an unbeaten 43 from 40 balls (4 fours), sharing a 5th wicket stand of 52 with Orla Prendergast (15) after the game was finely poised at 59 for 4. A final Irish total of 133 for 6 was always likely to be challenging for the young Scotland side, and so it proved. Clontarf seamer Maritz took 3 for 5 as Scotland collapsed to 31 for 5. Kathryn Bryce (25) offered some token resistance, but the hosts opted for respectability, finishing 54 runs adrift on 79 for 8. Amy Kenealy conceded just 13 runs in her four overs, while Cara Murray, Rache Delaney, Aisling Byrne, and Orla Prendergast picked up a wicket apiece. The afternoon contest proved even more one-sided as the bowling unit again stuck to their task well. Saintfield leg-spinner Cara Murray (2-11), Orla Prendergast (2-14) and Rachel Delaney (2-16) took two wicket each as Scotland made 98 for 7. Opener Sarah Bryce top scored with 34 from just 33 balls (4 fours) but received little meaningful support. The total proved woefully inadequate as openers Rebecca Stokell (39*) and skipper Una Raymond-Hoey raced to the target in just 64 balls. Stokell struck 5 boundaries and Raymond-Hoey four in a powerful opening stand, aided by some wayward bowling which saw 22 wides conceded. The teams meet again on Wednesday at the same venue for two more T20 matches.